Take from the rich and give to the poor this Halloween and live like an outlaw! The costume includes brown faux suede pants that have an elastic waist. The tunic is also faux suede in a hunter green color with brown trim at the front opening and along the bottom hem. The sleeves are highly embellished with metallic blue, dark green and tan stripes on the arms featuring bronze square and circular studs along the colors. The shoulders have two extra layers, one comes over the shoulder like a cap sleeve and is tied together for a look specific to his era. The top layer at the shoulders drapes down as if it were a partial cape and is decorated with red and gold metallic ribbons along with more bronze studs. The hood is attached to the tunic and is decorated with the same gold ribbons and gold studs. The quiver hangs across the body and is made of a black felt material. Add the dark green boot covers with brown stripes and gold studs for the finishing touch to an ornate costume! 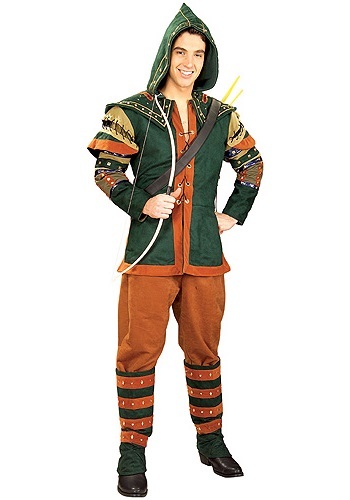 Get your band of merry men together and set out for a night of fun.